When the Southern Italians first arrived in America, their first ports of entry were the big eastern cities – Boston, New York, Philadelphia and others. Life in these metropolises was very different from the small, isolated mountain villages they came from, and it took them a while to negotiate the subtle and not so subtle differences they encountered. They were rustics who became easy prey for unscrupulous countrymen, the padroni, who promised them jobs, stole their money and exploited them. But they didn’t come to this country to trade one form of serfdom for another, they came to find work and fairness. The American political system was an almost impenetrable maze to them. One of the first things they noticed was that politics was dominated by the Irish who had arrived a generation or two earlier. Unlike the Italians, the Irish came from a country that had a strong parliamentary form of government. Even though they were brutally exploited and oppressed by the English, the Irish had a voice in the English parliament and they understood the power and importance of political engagement. In Italy, power was vested in the Catholic Church, King Umberto (il Buono) until 1900 and later his son, Victor Emmanuel, and the ineffective parliament which was dominated by Northern Italians. All jobs, money, and power flowed from Rome, and local government functionaries were not to be trusted. The lively scherzo played by the marching bands at our summer religious festas is the national anthem of the Kingdom of Italy, the Marcia or Fanfara Reale. Southern Italians loved their king. The political structure of cities like Boston was very different from that of rural Italy. Here, the Irish ward bosses ruled their fiefdoms with iron fists. In the North and West Ends, Martin Michael Lomasney was the undisputed boss and he dispensed jobs and favors to his political allies. In order to get a job or run for political office, an aspiring young person had to work his way up the political ladder. Lomasney ruled the ward from his headquarters, the Hendrick’s Club, located at the corner of Causeway and Lowell Streets. There is a story about Martin Losmaney which illustrates the influence of a ward boss. It is undoubtedly apocryphal, but certainly has a kernel of truth. It seems a young lad named Seamus Connolly moved to Boston from Galway without, as they say, “a farthing in his pocket or a pot to pee in.” He found his way to the West End and knocked on the door of the Hendrick’s Club. Martin Losmaney took him in and offered him some food and a bed. Seamus soon became indispensable. He tidied up the clubhouse, swept the floor and made himself useful in a number of ways. He carried signs at the polling stations and slipped political flyers under doors. In late December, he gathered the Boyos who had left the Ward and had moved to the streetcar suburbs to sleep on mattresses in the many local boarding houses so they would be registered to vote in the West End. On election day, Seamus proved to be a swift and trustworthy repeat voter and Martin took a liking to the bright young man. After a bit, Seamus indicated he would like to run for political office and sure enough Martin made him an alderman. In a few years, he moved him into the House of Representatives and, after that, Martin made him a state senator. Now Martin was known to have a volatile temper, and on that particular day he was writing his pre-election speech so his mood was especially foul. The ward boss era ended with Franklin Delano Roosevelt’s New Deal and federal programs like the Works Progress Administration, which took money and job creation away from local control. Politicians like James Michael Curley ran for office city-wide without the blessing of local ward bosses. Political campaigns were knock-em-down / drag-em-out affairs. Sound trucks roamed neighborhood streets and aspiring politicians would give impromptu speeches on street corners. Candidates with names similar to popular candidates were routinely placed on the ballot to split votes and voters were encouraged to “bullet vote” in order to favor a particular candidate at the expense of another. In the North End, a character named Charlie Ianello routinely had his name on the ballot trying to cadge votes from the much more popular Chris Ianella. Albert (Dapper) O’Neill speaking at the North End rally. In that era before television advertising, political consultants and social media politics was a personal affair, and campaigns in Boston climaxed with a massive torchlight parade down Blue Hill Avenue ending at the old G & G delicatessen. The local state senator, Julius Ansell, would give a rousing speech and introduce the candidates to the cheers of their supporters. These rallies were raucous affairs with cheering, booing and even a few fist fights. 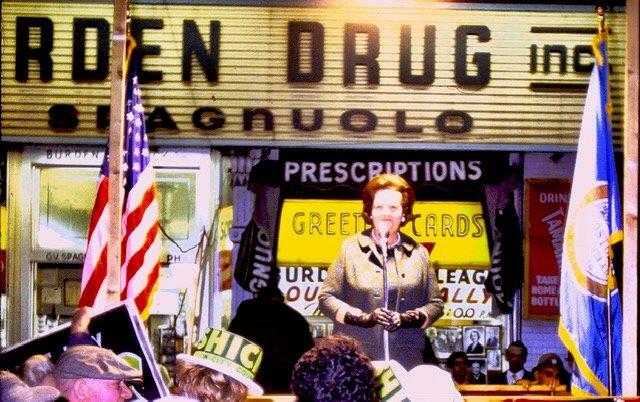 When the G & G closed in the mid 1960s, the Spagnuolo brothers, Louie and Jerry, revived the torchlight parades on Hanover Street ending at their pharmacy, Burden’s Drug Store. I was at one of the last of those old political rallies in 1969. Louise Day Hicks had lost a bitterly contested mayoral race to Kevin H. White in 1967 and was now running for her old city council seat on an anti-busing platform. White was the son of Joe White, a West Roxbury political operative known as, “Joe White and his Seven Jobs,” because of the number of city and state jobs he managed to simultaneously hold. School desegregation and forced busing were the main issues and the city was seething with anger and dissension. Two other city council candidates, Dapper O’Neill and Freddy Langone, were also at that rally, but when Hicks ascended the platform, regal in her Kelly green dress, the crowd went wild. “You know where I stand,” she said, and everyone did know, but busing became the law and Boston was forever changed. Boston had some of the best politicians money could buy. If memory serves me right there was a NE politician who was who was reelected while serving a stretch in the old Deer Island prison. I believe Mayor Curly was also reelected while serving a Federal stretch. Bob, Chinatown was, and still is, in the same electoral district as the North End. 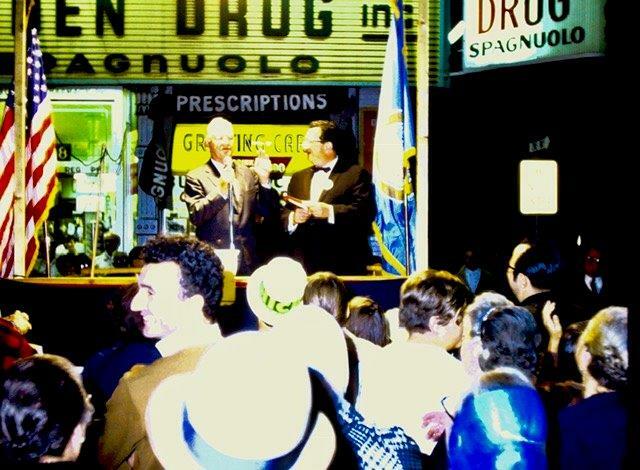 Many North End politicians such as JoJo Langone and Sal DiMasi were very popular with the Chinese voters and always carried the Chinatown precincts. Next time I see Sal I’ll ask him how he got all those Wongs and Lees to vote for him. Nick, Right! Gabe was appreciated in Chinatown for working hard to save it from wholesale demolition as they planned the Expressway route. I recall Danny Milano, who used to report on sports for the Italian News, who was a health inspector and covered Chinatown. He was proud of keeping restaurant kitchens clean and up to standards. Charlie Ianello was from Roxbury and was much more than a “straw” vote! He was much loved by the people of Roxbury and reelected many times. He was the one who won office while in Deer Island on a six month stretch. Like Curley, he did a favor for someone and got caught. He was high up in The Green Shoe, a shoe factory in Roxbury(later called Stride Right). If there was a fire in Roxbury, Charlie would be there to hand out new shoes to the victims and sometimes money.